Ford Motor Company says they’re “dedicated to helping” those touched by breast cancer. 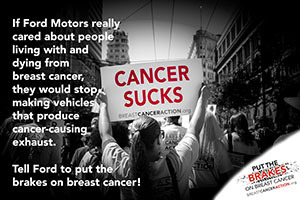 It’s a line they’ve been feeding us for decades and it’s part of their pink smoke screen that tries to cover up the truth—that the cancer-causing exhaust spewing out of the tailpipes of Ford’s vehicles is actually helping drive up the risk of breast cancer. That’s why this Pinktober, we told Ford “Enough!” And to make sure they got the message, we published an open letter to the giant auto manufacturer in the two biggest newspapers in Michigan where Ford’s headquarters are located. Our letter, which was endorsed by 15 partner organizations, ran in the Detroit Free Press and the Detroit News the first three days of the month and reached over 180,774 people each day. But that’s not all. You joined with us on social media to keep the pressure on and to help call out Ford’s pinkwashing ways. You raised your voices so loudly, our memes and messages reached almost 400,000 people on social media and together we educated tens of thousands of people about the harms of cancer-causing vehicle exhaust. Common Dreams published our op-ed and 20 organizations—from environmental orgs to nurses’ groups—endorsed our campaign and joined our call to demand Ford take action to protect public health. 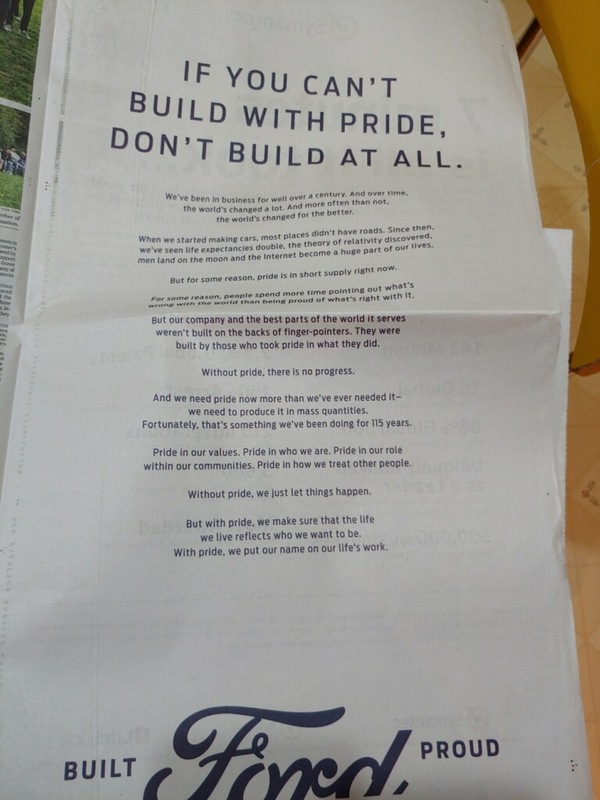 Outrageously, instead of responding to our concerns about their vehicles’ cancer-causing exhaust, Ford chose more empty PR and purchased a full-page ad in the New York Times complaining about people pointing out what’s wrong with the world and claiming that what we really need right now is “pride,” because “without pride, there is no progress.” We clearly got under the skin of one of the big-three auto companies and made our voices heard. At Breast Cancer Action, we believe progress looks different. It looks like fewer women being diagnosed and dying from breast cancer, fewer toxic chemicals in our environment that are linked to the disease, and fewer pinkwashing companies and organizations in the world. Our “Put the Brakes on Breast Cancer” campaign is one piece of our work to protect us all from chemicals linked to increased breast cancer risk. Working to put public health before industry profit takes time and fierce activists like you. Help us expand our reach by asking your family and friends to sign up for our action alerts today and stay tuned for ways to help us keep standing up for women’s health! ← Your Gift Will be Doubled This #GivingTuesday!